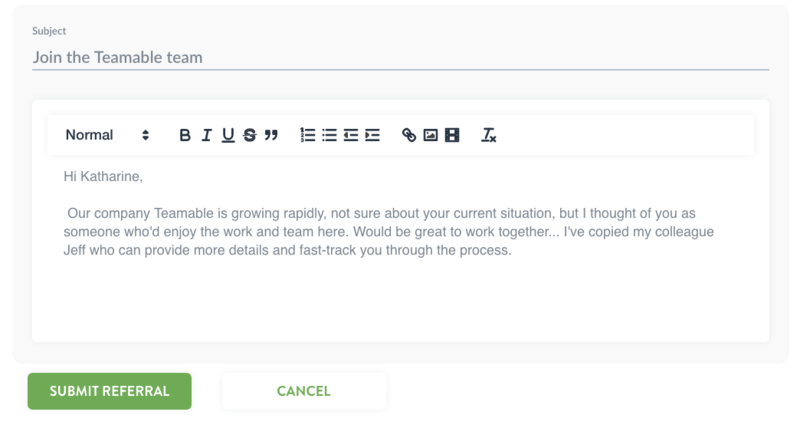 Here's how to quickly help your company by making referrals with Teamable. The fastest growing and healthiest companies in the world have over 60% of their hires from employee referrals and passive candidates--people who aren’t actively looking for a job but would likely be more engaged and productive in a different job and on a different team. At Teamable, it’s our mission to help better connect people to work they love with people they love and build the teams that build tomorrow. Through four years of research evaluating the best teams and teammates at our customer companies, we now know that when employees take an active role in guiding their hiring teams to the best talent in their social networks, the growth of that company and the happiness of their employees and the impact that company has on society is accelerated. And of course, their employees spend a lot less time on interviews and team dynamics issues, and more time delivering great products to the world. So to that end, here’s how with just a few minutes of work, you can help build better teams and increase your company’s effectiveness, and at the same time, help your social connections discover interesting opportunities. Click on Refer>Open Jobs and choose any job you'd like to make referrals for. Tip: We recommend starting with a job in your department where you might have more first degree connections. Figure One: Choose an open job to get started making referrals. For each job, will see your suggested matches. Figure Two: See suggested matches for chosen job. Note: You can search by name if you're looking for a specific person in your network whom you'd like to refer. Otherwise, you can click on 'Refer' to make the referral. When you click on 'Refer' you will see the suggested text your recruiting team has provided. You can make any changes to the subject or body or send as is by clicking 'Submit Referral'. Figure Three: Sending a referral message. Note: depending on how your recruiter has set up the job, the message will either go out right away to your contact or be queued pending approval by the recruiter or hiring team before being sent. Hot Jobs. Hot jobs are any that a recruiter or hiring manager has identified as a top priority. For each, you will see a fire icon next to the job title and the job will appear on the top of the job page. You will also see everyone you know that may be match directly on the right. 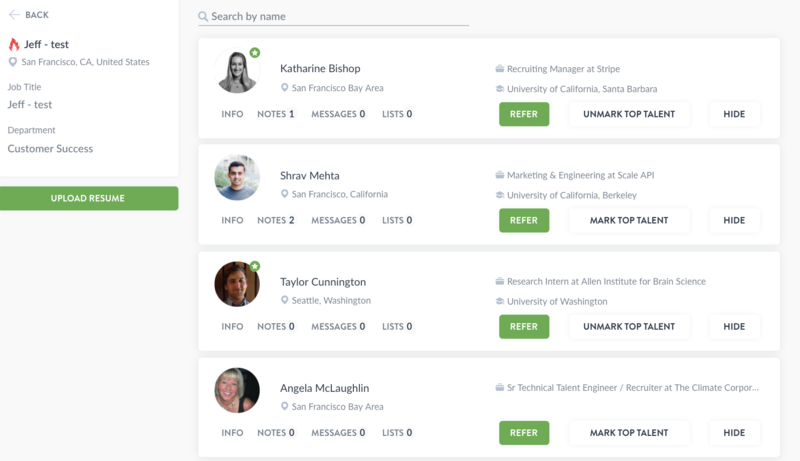 Figure Four: Your connections appear directly on the jobs page for any hot job. In cases, where you don't have any matches, Teamable will let you know. Figure Five: Example of a job for which you have no suggested matches. Try another! Read more about Marking Top Talent and leaving notes.